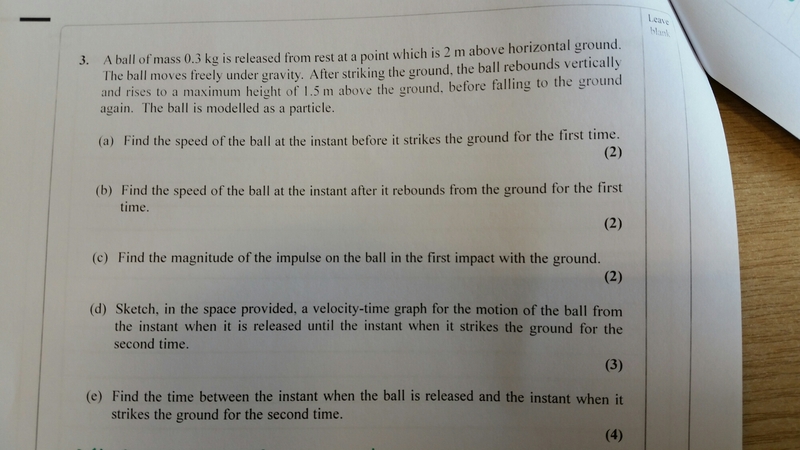 It’s quite a nice, general bouncing ball question that takes into account many of the rules of mechanics. When I finished the question I checked it against the markscheme so I could jot down where each mark came from and on part E I received a bit if a shock. I don’t understand why they have felt the need to work out the time between the first bounce and the top then double it. 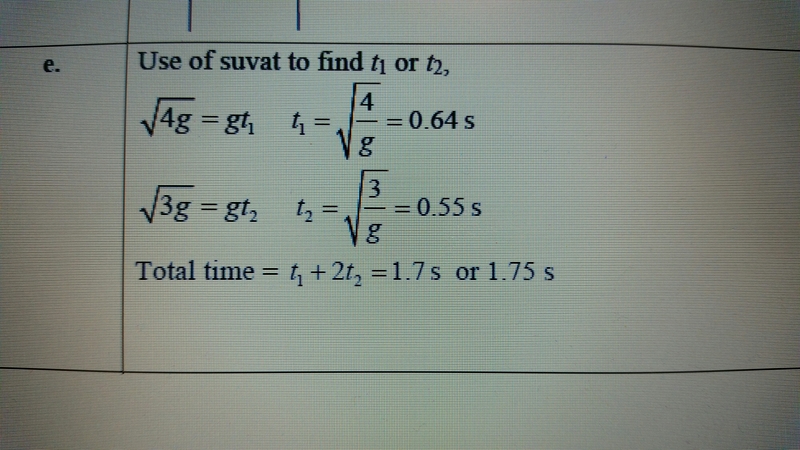 It’s a valid mrthod, granted, but surely looking at the whole motion is sensible as acceleration is constant? Worryingly, in the notes there’s no other solutions offered and I was left wondering if examiner’s might miss that thus method is not only correct,, but actually more sensible. Which way would you have done it? Do you think I’m correct thinking mines the mire logical sensible way? Last year I wrote this piece discussing some of the worst pseudo-contexts that I’d come across in maths exams. You know the ones, the ridiculous made up contexts that are supposed to give a real life twist to a question but Ard actually anything but. 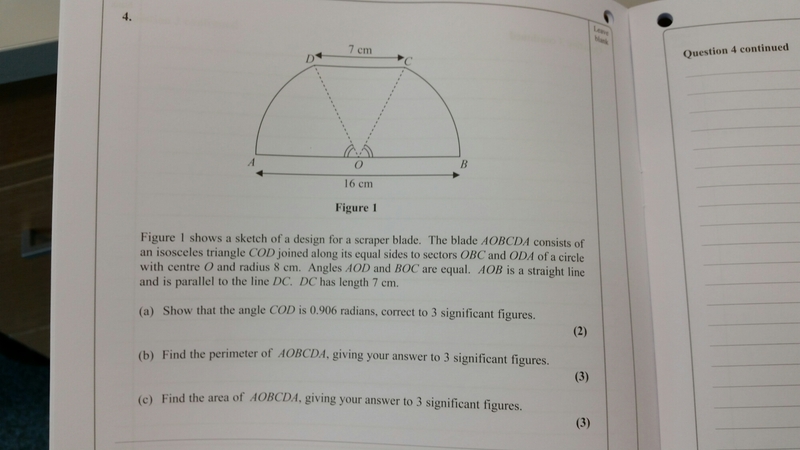 Well this year’s C2 Edexcel A Level paper has two of the worst I’ve ever seen! There are a few issues I have with this question. Firstly we have a whole paragraph that is entirely unnecessary! The only purpose this paragraph would serve was to test the ability to sketch or visualise but this us completely negated by the diagram. One of my year 12s asked, “what’s the point in that writing on the sectors question? It just described the picture.” I had to agree. That wasn’t the worst bit though, the worst bit is there at the beginning . What even is a scraper blade, and why do we need this question be about one?! This was actually a great question, or would have been if it had only one of the picture or the paragraph and no stupid mention of a scraper blade. “A solid glass cylinder, which is used in an expensive laser amplifier, has a volume of 75pi cm^3. Show that the cost is, then find the minimum. This question is pseudo-context at its worst. A part for an expensive laser amplifier will be the required size for said amplifier. 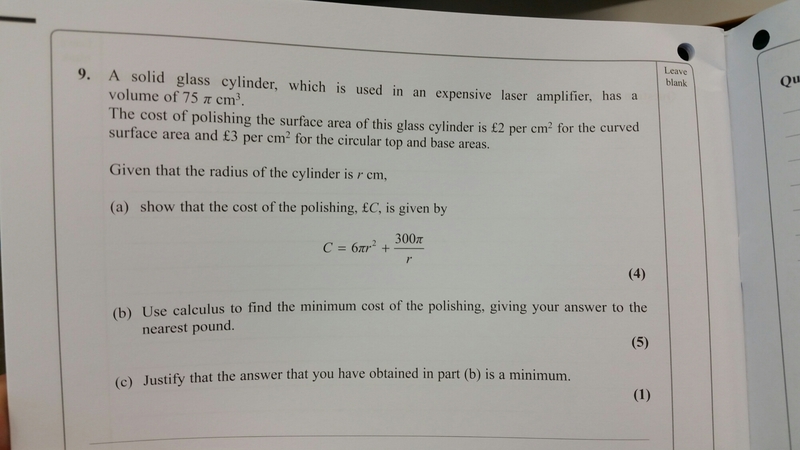 It will need to fit abd as such it’s length and radius will be far more important that it’s volume, do there’s no way at all that they would design the laser around the minimum cost of polishing a cylinder with a certain volume! Why would you create such a convoluted, nonsensical, bogus context?! If you want to ask questions in context fine, but please make it a believable one! This post was originally posted here on Labour Teachers. A favourite piece of policy from our Education Secretary seems to be the introduction of new “Free Schools”. It was the baby of her predecessor and was an extension of the academies project. I have a few issues with free schools. Firstly, they are often built in areas that have no real need, leaving a surplus of school places in some regions and a deficit in other. This can lead to some parents having to arrange travel over quite long distances to ensure their offspring can attend school. The fact that parents in less well off areas don’t have the means to ensure free schools open in their vicinity means that they are often the areas that end up with a deficit of places and larger travel bills. The other main issue I have with them is the added freedoms they have, which I believe are the same freedoms given to academies. I worry that these freedoms can cause a larger inequality within the state education sector. I’m a fan of the idea of a national curriculum, a minimum standard that all students should be a party to, but academies and free schools don’t have to stick to it. This could put some young people in a much better place than others depending on their school. I was against the principle of academies when the last Labour government introduced them. The idea that “state” education could be run by chains that were based on a business model clashed with my ideological viewpoint. But I could at least see the idea came from the right place, from the idea of putting more money into failing schools. The roll out under Gove to put more money into already outstanding schools seemed bizarre. That said, I have now worked in a number of academies run by a number of sponsors, and I have enjoyed my time in them. I do think, however, that this has been down to those in charge. I have heard from friends in other chains that staff welfare is low in the priority list, that staff feel under pressure and that they feel their pay and conditions have suffered detrimental effects since academisation. In my last role I was a union representative at a time when Gove was tearing up the burgundy book, introducing PRP and generally going to war. The unions were concerned about the particular academy chain we were part of and issued guidance on which specific policies we should reject. They didn’t come, after a while we arranged to meet the head to discuss, the meeting was short and pointless really as we expressed our concerns and we’re told “I know, I couldn’t believe they expected me to implement those policies so I’ve sent them back with my views made clear and I’m waiting for their response.” It made me very thankful to have her as a head, but also worried a little about colleagues in other schools in the chain. The other sponsors I’ve worked for have been 2 and 3 academy trusts and they seen much better, but again I wonder how much the principals have protected us from. In general, some academies and free schools are run ethically, with student and staff welfare at their heart but not all are. And that is still a major worry for me. Surely all schools should be subject to the same rules, the same regulations and the same protections.